A, Healthy controls. B, Individuals with an at-risk mental state. C, Patients experiencing a first-episode psychosis. Activations are reported at a whole-brain–corrected cluster threshold of P < .001 and a voxel size threshold of 1400. Numbers 1 through 4 indicate right superior parietal lobule, left superior parietal lobule, right middle frontal gyrus, and left middle frontal gyrus, respectively. We contrasted models in which the 2-back working memory (WM) condition was allowed to modulate within both hemispheres: the parietofrontal connections (top row), the frontoparietal connections (middle row), or both (bottom row). These 3 intrahemispheric options were crossed with 4 possibilities for which interhemispheric connections might be modulated by the 2-back WM condition: none (A), the interhemispheric connections between the parietal areas (B), the interhemispheric connections between the frontal areas (C), or both (D). As a result, our model space consisted of 12 alternative models, each of which was fitted to the data from each study participant. Sensitivity indexes during the 2-back conditions in healthy controls (HCs) (n = 19), individuals with an at-risk mental state (ARMS) (n = 15), and individuals with first-episode psychosis (FEP) who were nontreated (n = 12) or antipsychotic treated (n = 8). Asterisk indicates significant differences among the groups at P < .05. Error bars indicate SEs. Data are shown for all groups together and separately for healthy controls (HCs), at-risk mental state (ARMS) individuals, and first-episode psychosis (FEP) patients. Data are shown for healthy controls (HCs) (n = 19), individuals with an at-risk mental state (ARMS) (n = 15), and all patients with first-episode psychosis (FEP) (n = 20), independent of antipsychotic treatment. The y-axis denotes the mean for all study participants and all 12 dynamic causal models (using bayesian model averaging) with regard to the posterior mean of the modulatory effect; this encodes changes in connection strength induced by the 2-back WM condition. Asterisk indicates significant differences among groups at P < .05; dagger, significant t test within each group (relative to zero) at P < .05. Error bars indicate SDs derived from bayesian parameter averages. Data are shown for healthy controls (HCs) (n = 19), individuals with an at-risk mental state (ARMS) (n = 15), and individuals with a first-episode psychosis (FEP) who were antipsychotic treated (n = 8) or nontreated (n = 12) during scanning. The y-axis denotes the mean for all study participants and all 12 dynamic causal models (using bayesian model averaging) with regard to the posterior mean of the modulatory effect; this encodes changes in connection strength induced by the 2-back WM condition. Asterisk indicates significant differences among groups at P < .05; dagger, significant t test within each group (relative to zero) at P < .05. Error bars indicate SDs derived from bayesian parameter averages. Macmillan N, Creelman C. Detection Theory: A User's Guide. Cambridge, England: Cambridge University Press; 1991. Importance Brain imaging studies have identified robust changes in brain structure and function during the development of psychosis, but the contribution of abnormal brain connectivity to the onset of psychosis is unclear. Furthermore, antipsychotic treatment can modulate brain activity and functional connectivity during cognitive tasks. Objectives To investigate whether dysfunctional brain connectivity during working memory (WM) predates the onset of psychosis and whether connectivity parameters are related to antipsychotic treatment. Design Dynamic causal modeling study of functional magnetic resonance imaging data. Setting Participants were recruited from the specialized clinic for the early detection of psychosis at the Department of Psychiatry, University of Basel, Basel, Switzerland. Participants Seventeen participants with an at-risk mental state (mean [SD] age, 25.24 [6.3] years), 21 individuals with first-episode psychosis (mean [SD] age, 28.57 [7.2] years), and 20 healthy controls (mean [SD] age, 26.5  years). Main Outcome and Measure Functional magnetic resonance imaging data were recorded while participants performed an N-back WM task. Functional interactions among brain regions involved in WM, in particular between frontal and parietal brain regions, were characterized using dynamic causal modeling. Bayesian model selection was performed to evaluate the likelihood of alternative WM network architectures across groups, whereas bayesian model averaging was used to examine group differences in connection strengths. Results We observed a progressive reduction in WM-induced modulation of connectivity from the middle frontal gyrus to the superior parietal lobule in the right hemisphere in healthy controls, at-risk mental state participants, and first-episode psychosis patients. Notably, the abnormal modulation of connectivity in first-episode psychosis patients was normalized by treatment with antipsychotics. Conclusions and Relevance Our findings suggest that the vulnerability to psychosis is associated with a progressive failure of functional integration of brain regions involved in WM processes, including visual encoding and rule updating, and that treatment with antipsychotics may have the potential to counteract this. The presented DCM analyses are based on the fMRI data previously published by Smieskova et al.25 Details of the mass-univariate statistical parametric mapping (SPM) analyses are described in the previous publication. In this article, we provide a summary of the participants’ characteristics and details of data analysis with DCM and bayesian model selection (BMS). In addition, a brief summary of the N-back task and fMRI data acquisition protocol is given in the eMethods in the Supplement. We recruited ARMS individuals and FEP patients in our specialized clinic for the early detection of psychosis at the Department of Psychiatry, Psychiatric University Hospital Basel, Basel, Switzerland. These patients were allocated to either the FEP or ARMS group according to the Program Approval for Continuing Education criteria. Given the possibility of FEP resulting from an initial (and possibly unnoticed) ARMS, it would have been interesting to address the question of how many of our FEP patients have transitioned from ARMS. However, because of our cross-sectional design, this was not possible in the present study. All participants provided written informed consent, and the study had research ethics committee permission. We assessed individuals using the Basel Screening Instrument for Psychosis,31 the Brief Psychiatric Rating Scale (BPRS), the Scale for the Assessment of Negative Symptoms, and the Global Assessment of Functioning. We additionally obtained information on current and previous psychotropic medication, nicotine, and illegal drug consumption using a semistructured interview adapted from the Early Psychosis Prevention and Intervention Centre Drug and Alcohol Assessment Schedule (eppic.org.au). The following exclusion criteria for all groups applied: history of previous psychotic disorder, psychotic symptoms secondary to an organic disorder, substance abuse according to International Statistical Classification of Diseases, 10th Revision (ICD-10) research criteria, psychotic symptoms associated with an affective psychosis or a borderline personality disorder, age younger than 18 years, inadequate knowledge of the German language, and IQ less than 70 as measured by the Mehrfachwahl Wortschatz Test Form B. In keeping with previous MRI studies8,13 of ARMS individuals, we recruited 17 ARMS individuals using these high-risk criteria. 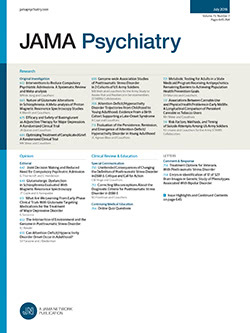 Inclusion into the present study required one or more of the following: (1) attenuated psychotic-like symptoms, (2) brief limited intermittent psychotic symptoms, or (3) a first- or second-degree relative with a psychotic disorder plus at least 2 additional risk factors for or indicators of beginning psychosis according to the Basel Screening Instrument for Psychosis. Inclusion because of attenuated psychotic symptoms required that change in mental state had to be present at least several times a week and for more than 1 week (a score of 2 or 3 on the BPRS hallucination item or 3 or 4 on BPRS items for unusual thought content or suspiciousness). Inclusion because of brief limited intermittent psychotic symptoms required scores of 4 or above on the hallucination item or 5 or above on the unusual thought content, suspiciousness, or conceptual disorganization items of the BPRS, with each symptom lasting less than 1 week before resolving spontaneously. A more detailed description of these ARMS criteria can be found in a previous publication.32,33 All ARMS individuals were antipsychotic naive. The FEP patients (n = 21) were those who met the criteria for transition to psychosis according to Yung et al.34 These patients already fulfilled criteria for acute psychotic disorder according to ICD-10 or DSM-IV but not yet for schizophrenia. Inclusion required scores of 4 or above on the hallucination item or 5 or above on the unusual thought content, suspiciousness, or conceptual disorganization items of the BPRS.34 The symptoms must have occurred at least several times a week and persisted for more than 1 week. Seven FEP patients were completely antipsychotic naive, whereas 6 had previously been treated with antipsychotics but were antipsychotic free at the time of this study. Eight FEP patients were receiving antipsychotics at the time of scanning (5 patients receiving quetiapine and 2 patients receiving paliperidone for less than 6 months and 1 patient receiving olanzapine for less than 2 years). We recruited 20 HCs from the same geographic area as the other groups. The HCs had no current psychiatric disorder; no history of psychiatric illness, head trauma, neurologic illness, serious medical or surgical illness, or substance abuse; and no family history of any psychiatric disorder as assessed by an experienced psychiatrist (J.A., S.J.B., A.R.-R.) in a detailed clinical semistructured interview. We used DCM-10 (revision No. 4290) as implemented in SPM-8 to analyze effective connectivity. In DCM for fMRI, the dynamics of the neural states underlying regional BOLD response are modeled by a bilinear differential equation that describes how the neural states change as a function of endogenous interregional connections, modulatory effects on these connections, and driving inputs.24,35 The endogenous connections represent coupling strengths in the absence of inputs to the system (independent of the task), whereas the modulatory effects represent context-specific and additive changes in coupling (eg, task-induced alterations in connectivity). The modeled neuronal dynamic is then related to the measured BOLD signal using a hemodynamic forward model.35 We explicitly examined how the coupling strengths between prefrontal and parietal regions are changed by the 2-back condition (modulatory effect). The regions of interest of our anatomical network were selected on the basis of 3 sources of information: (1) the previously published second-level SPM analysis of these data,25 (2) previous functional connectivity studies emphasizing the importance of frontoparietal connections for WM,36 and (3) previous DCM studies of WM in schizophrenia.3,11 The conventional second-level SPM analysis had revealed significant activation in the bilateral superior parietal lobule (SPL) and middle frontal gyrus (MFG) in all groups (Figure 1),25 whereas ARMS individuals and FEP patients had reduced SPL and MFG activations, suggesting differences in brain connectivity among groups. To test this hypothesis, we created an anatomical mask comprising the SPL and MFG taken from the automated Talairach atlas in the Wake Forest University Pick Atlas toolbox.37 Similar to previous DCM studies in ARMS individuals,38 regional time series from each participant were extracted from spherical volumes of interest with 12 mm in diameter that were centered on the group maxima of the 2-back greater than 0-back contrast within the anatomical mask using the first eigenvariate of voxels above a participant-specific F threshold of P < .001 (uncorrected). When a participant had no voxel above threshold at the group maxima (eTable 1 in the Supplement), we selected the nearest suprathreshold voxel within the mask. Four participants revealed no activated voxels under these criteria (1 HC, 2 ARMS individuals, and 1 FEP patients) and were therefore excluded from further analyses. Across all models tested, we assumed the same network layout of connections between right and left SPL and MFG. Specifically, SPL and MFG were reciprocally connected within both hemispheres, with additional interhemispheric connections among all regions. Similar to a recent DCM study of WM,39 the visual input (driving) entered the SPL bilaterally.40 Starting from this basic layout, a factorially structured model space was derived by considering where the modulatory effect of the 2-back WM condition might be expressed within both hemispheres (for a graphic summary of the model space see Figure 2). In a first step, BMS was conducted treating HCs, ARMS individuals, and FEP patients as one group. Because data from the groups may be generated by different mechanisms and, thus, different models may explain the groupwise data best,3 we performed BMS also for each groups separately. Statistical comparison of model parameter estimates across groups is only valid if those estimates stem from the same model. Given that different models may be found to be optimal across groups, bayesian model averaging (BMA) has been recommended as the standard approach for clinical DCM studies.43 The BMA averages posterior parameter estimates over models, weighted by the posterior model probabilities.44 Thus, models with a low posterior probability contribute little to the estimation of the marginal posterior. After BMA, we used the resulting posterior means from the averaged DCM for examining differences among groups. In this article, we focused on WM-induced changes in connectivity. Thus, we test for group differences in the modulatory parameters only. We then used 1-way analysis of variance (ANOVA), asking which of the connectivity parameters differed across groups. In a first step, all 20 FEP individuals were treated as one group for ANOVA. To address the effect of antipsychotics on effective connectivity, in a second step, 2 FEP subgroups were included in a subsequent ANOVA based on whether they were treated with antipsychotics (n = 8) or nontreated (n = 12). Bonferroni-corrected post hoc t tests were conducted after obtaining significant ANOVA results. Clinical and sociodemographic differences were previously analyzed and published by Smieskova et al25; we repeat them here for completeness. Beyond those previous analyses, we analyzed behavioral performances during the 2-back WM condition using signal detection theory.45 The sensitivity index was calculated using the formula z(Hits) − z(False Alarms). The equal weighting of hits and false alarms provides an objective measure of sensitivity that is independent of participant response bias. The sensitivity index values were further subjected to a 1-way ANOVA. When the ANOVA null hypothesis of equal means was rejected, we used Bonferroni-corrected post hoc t tests. Demographic and clinical group characteristics are summarized in eTable 2 in the Supplement. Working memory performance as operationalized by the sensitivity index differed across HCs, ARMS individuals, and FEP patients (F = 5.12; P = .009). Specifically, FEP patients (P = .008) had significantly lower WM performance than HCs. The WM performance in the ARMS group was also lower than in the control group, but this difference did not reach statistical significance (P = .14). In a subsequent ANOVA we distinguished antipsychotic-treated from nontreated FEP patients (F = 3.44; P = .02) and found that only nontreated (P = .03) but not antipsychotic-treated FEP individuals (P = .27) differed from HCs (Figure 3). The BMS yielded variable results across groups (Figure 4). When testing all groups together, model 12 was found to be most likely (EP = 47.73%), followed by model 4 (EP = 33.73%), model 6 (EP = 8.55%), and model 9 (EP = 7.56%). When applying BMS to each group separately, however, slight variations emerged. In HCs, model 4 emerged as the most likely model (EP = 63.43%), whereas model 12 was only second best (EP = 22.41%) and model 9 the third best (EP = 6.44%). In ARMS individuals, model 12 was identified as most likely (EP = 27.63%), followed by model 2 (EP = 27.17%) and model 9 (EP = 21.22%). In all FEP patients together, model 6 was clearly superior to all other models (EP = 58.05%), whereas model 12 was second best (EP = 18.47%) and model 4 the third best (EP = 11.7%). These BMS results across all groups are summarized in Figure 4. Statistical analysis of group differences in connection strengths concerned the posterior means of coupling estimates, following BMA for all 12 models. In other words, we compared the parameter estimates from participant-specific DCMs that were averaged over the 12 models (by using BMA) separately within each group. Thus, in our final group-level analysis of effective connectivity, we were able to test for differences among groups in 8 parameters describing the modulation of frontoparietal connections, within and across hemispheres, by the 2-back WM condition. For the modulatory effect, significant group differences were found for the right MFG to SPL connectivity (F = 3.70; P = .03). Bonferroni-corrected post hoc t tests revealed that the right MFG to SPL connectivity was significantly reduced in FEP patients compared with HCs (P = .048), whereas the MFG to SPL connectivity in ARMS individuals was lower than in the control group, although this finding was not statistically significant (P = .10) (Figure 5). In contrast to these intrahemispheric connectivity differences among groups, we did not find significant group differences in the modulation of interhemispheric connections by the 2-back WM condition. After dissociating antipsychotic-treated from nontreated FEP patients, a subsequent ANOVA on the modulatory effect revealed significant group differences for the right MFG to SPL connectivity across groups (F = 2.99; P = .04). In particular, Bonferroni-corrected post hoc t tests revealed that the right MFG to SPL connectivity in HCs is dissociable from nontreated FEP patients (P = .046) but not from antipsychotic-treated FEP patients (P > .99) (Figure 6). The Table summarized the DCM parameters for all groups. Furthermore, using a multiple regression analysis, we did not find any significant relationship between the right MFG to SPL connectivity and clinical and demographic variables (statistics are provided in eTable 3 in the Supplement). In the present study we investigated whether there are changes in the modulation of within- and across-hemisphere functional interactions between the SPL and MFG by WM that predate the onset of psychosis and are related to antipsychotic treatment. We found that the modulatory effect on the MFG to SPL connectivity induced by the 2-back WM condition was gradually reduced from HCs to ARMS individuals and further to nontreated FEP patients. Remarkably, nontreated but not antipsychotic-treated FEP patients differed significantly from HCs with regard to the modulatory effect of WM on the MFG to SPL connectivity. The behavioral performance differed between nontreated FEP patients and HCs, whereas ARMS individuals showed an intermediate performance, which was not significantly altered compared with HCs. This finding is consistent with a previous study in ARMS individuals and FEP patients, which reported that in the FEP group the proportion of correct responses was significantly lower than in the control group, whereas in the ARMS group the proportion of correct responses was lower than in the control group but did not reach statistical significance.46 In contrast, other studies11,15 found no significant group differences among HCs, ARMS individuals, and FEP patients in the number of missed targets, misidentified nontargets, and error rates, respectively, while performing the N-back task. In the later study,15 the lack of behavioral differences among groups is due to excluding from the analysis individuals who performed the task badly and the study being powered to detect physiologic changes. Furthermore, instead of evaluating the number of omissions or error rates, in this study we analyzed the 2-back WM performances using signal-detection theory.45 Although this precludes a direct comparison with the previous studies mentioned, the advantage of using the sensitivity index is that it provides an objective measure independent of the individual’s response bias. Thus, in our study, when equally weighting hit rates and false alarms, the 2-back WM performance did significantly distinguish nontreated FEP patients from HCs, whereas the WM performance in ARMS individuals came out in the middle of both groups. Moreover, contrary to nontreated FEP patients, no significant difference was found in antipsychotic-treated FEP individuals compared with HCs, indicating an improved cognitive performance after antipsychotic medication. This result is in line with recent studies in early-psychosis patients47 and in those with chronic schizophrenia,48 which reported significant improvements in neurocognition after the treatment with antipsychotics. We found a gradual reduction of the modulatory effect on the MFG to SPL connectivity from HCs to ARMS individuals and further to nontreated FEP patients. Although our result of a reduced right MFG to SPL connectivity in nontreated FEP patients agrees with reports on reduced frontoparietal connectivity in patients with schizophrenia,3 Crossley et al11 reported a progressive increase in the frontotemporal connectivity in individuals with FEP. However, the results of the 2 studies are not directly comparable because of several major methodologic differences, including different contrasts used to identify WM-associated activations and different regions of interest. Furthermore, and perhaps most importantly, Crossley and colleagues focused on endogenous connections and not on connectivity changes, reflecting changes in the endogenous coupling between regions that are induced by experimental manipulations (ie, 2-back) as in this study. The N-back task comprises numerous simultaneous cognitive processes, including a continuous encoding of incoming visual letters and rule updating. Although WM research has traditionally focused on mechanisms for maintaining stimulus representations, more recently the importance of rules for relating those stimuli to pending responses has been emphasized.49 These rules embody the if-then relationships that underlie decisions (eg, “If the letter presently displayed corresponds to the letter shown 2 trials ago, press the right button”) and that may change in time, as in the N-back task. Connections from the parietal cortex to the frontal cortex may contribute to the encoding of incoming stimuli,39 whereas the connections from the frontal to the parietal cortex likely mediate the updating of rules (eg, 2-back).36 Our DCM analyses suggest a reduced modulation of MFG to SPL connectivity by the 2-back WM condition (relative to 0-back and 1-back) in nontreated FEP individuals. If the common interpretations of bottom-up and top-down connections between parietal and prefrontal areas mentioned above are correct, this result would indicate a specific failure in rule updating during WM in nontreated FEP individuals. However, this specific interpretation should be treated with caution because our experimental design did not separately manipulate demands on visual stimulus encoding and rule updating. Notably, the reduction of the right MFG to SPL connectivity between HCs and nontreated FEP patients was not found between HCs and antipsychotic-treated FEP patients. This is consistent with previous fMRI studies reporting that antipsychotic treatment can modulate brain activity during cognitive tasks29,30 and, more specifically, functional connectivity in circuits that are involved in mediating the cognitive symptoms in schizophrenia.50 Furthermore, our result fits with a recent study51 in FEP patients reporting that after 6 weeks of treatment with second-generation antipsychotic drugs, frontoparietal-temporal network connectivity during resting state was no longer significantly different from controls. Our present results echo this finding and suggest that antipsychotic treatment also normalizes frontoparietal connectivity during a WM task in FEP patients, which might explain their improved cognitive performance relative to nonmedicated patients. There are some limitations to be considered in the present study. Because of the chosen block design in this study, we were not able to distinguish among the different components of the WM process, although patients with psychosis reveal different impairments during encoding, retrieval, and information manipulation.54,55 Furthermore, we used a fairly simplistic neuronal network underlying WM-dependent effective connectivity with bilinear modulation of connections.24 There are also other brain regions involved in WM tasks, such as the anterior cingulate cortex,39 whose structural abnormalities have also been reported to be predictive for development of psychosis13 but that we did not include in our present model for reasons of parsimony and comparability with previous studies3 of connectivity during WM tasks in schizophrenia. Furthermore, the 8 antipsychotic-treated FEP patients received different antipsychotic medication in terms of substance and duration of the treatment. With this relatively small sample size, it is impossible to further subdivide the group of antipsychotic-treated FEP patients and determine drug-specific effects. Finally, the short duration of clinical follow-up did not allow investigating transition outcome–associated connectivity abnormalities. In conclusion, our present findings suggest that abnormalities in WM-induced modulation of connectivity may separate HCs from ARMS individuals and FEP patients and may thus serve as a physiologic marker that predates the onset of psychosis. Moreover, as demonstrated in previous studies,53 the current study further demonstrates the potential of quantitative connectivity analysis for inferring the effects of antipsychotic treatment. These findings may particularly benefit clinical efforts to predict the onset of psychosis from the extent of dysfunctional connectivity during WM. Corresponding Author: Stefan J. Borgwardt, MD, PhD, Department of Psychiatry (UPK), University of Basel, Petersgraben 4, Basel 4031, Switzerland (stefan.borgwardt@upkbs.ch). Published Online: July 3, 2013. doi:10.1001/jamapsychiatry.2013.117. Author Contributions:Study concept and design: Schmidt, McGuire, Riecher-Rössler, and Borgwardt. Acquisition of data: Smieskova, Aston, Simon, McGuire, Riecher-Rössler, and Borgwardt. Analysis and interpretation of data: Schmidt, Smieskova, Simon, Allen, Fusar-Poli, McGuire, Riecher-Rössler, Stephan, and Borgwardt. Drafting of the manuscript: Schmidt and Smieskova. Critical revision of the manuscript for important intellectual content: Schmidt, Aston, Simon, Allen, Fusar-Poli, McGuire, Riecher-Rössler, Stephan, and Borgwardt. Statistical analysis: Schmidt, Allen, and Stephan. Obtained funding: McGuire, Riecher-Rössler, and Borgwardt. Administrative, technical, and material support: Aston, Simon, McGuire, and Riecher-Rössler. Study supervision: Fusar-Poli, McGuire, Riecher-Rössler, and Borgwardt. Funding/Support: This study was supported in part by grant 3232BO_119382 from the Swiss National Science Foundation (Drs Schmidt and Borgwardt) and from the René and Susanne Braginsky Foundation (Dr Stephan). Additional Contributions: The Früherkennung von Psychosen Study Group recruited and managed the study participants. In addition, we acknowledge the contribution of the study participants.